'Molly's Game' Is Aces Aaron Sorkin's directorial debut is a dense, complicated, frenetically paced movie about a woman who runs a high-stakes poker game; critic Bob Mondello is all-in. 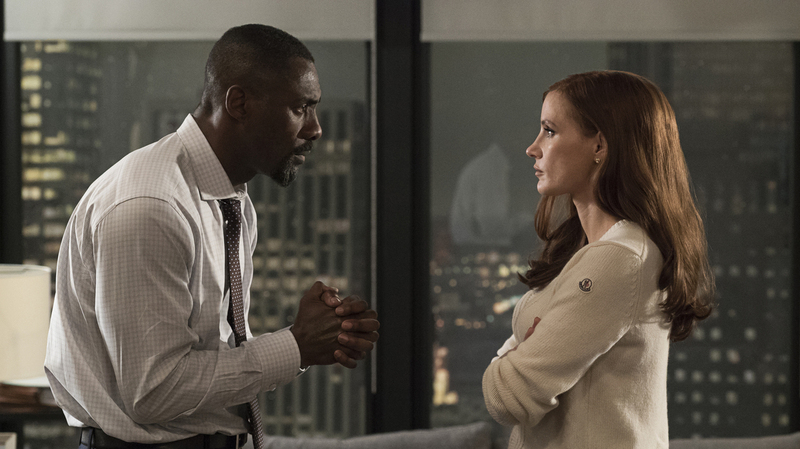 Idris Elba and Jessica Chastain star in Molly's Game. Molly Bloom (Jessica Chastain) is a fighter. When a freak accident on the slopes sidelines her bid to become an Olympic skier — an accident from which she insists upon walking away — she moves to Los Angeles and gets a job as a cocktail waitress. Molly meets Dean (Jeremy Strong) while working at the bar, and gets hired as his office assistant. He's got rich friends — famous actors and international businessmen — for whom he organizes a regular high-stakes poker game. Molly's great at running the game for Dean, but when they part company, she starts her own game, with even higher stakes, taking his movie stars and high rollers with her. She gets so successful that she's soon running a game in New York, writing a book ... and getting shut down by the FBI. She finds a lawyer (Idris Elba) who can keep up with her, and their trademark, Sorkinian back-and-forth dialogue is exhilarating, even if it doesn't reveal a lot about their interior lives. If Molly has a boyfriend, or a sweet tooth, or a cat, you won't find out from what's onscreen. But Sorkin makes the finer points of poker — and legal maneuvering — crystal clear. Some of the clarity comes from that snappy dialogue, some from voiceovers that fill in when the folks onscreen have to catch their breath. And even though this is Sorkin's directing debut, quite a bit of the clarity comes from the visuals, annotated when necessary, precisely shot and edited with nearly every trick known to contemporary filmmaking. It doesn't hurt that Sorkin's cast is as whip-smart as the lines they're delivering. Molly's Game is a dense, complicated movie, made by a guy who excels at — who positively glories in — making the dense and complicated enormously entertaining.